Vero Modero has a line of new winter collection items in the store, many of them white or red and lovely to wear for a formal occasion during this winter. Out of many I decided to wear a gown called the Mistwalker White Gown which is a gorgeous silky gown with a pale animal print top, giving it a silvery look to the over all colour. Mind you, there is a red one too for those who like to have more colour! 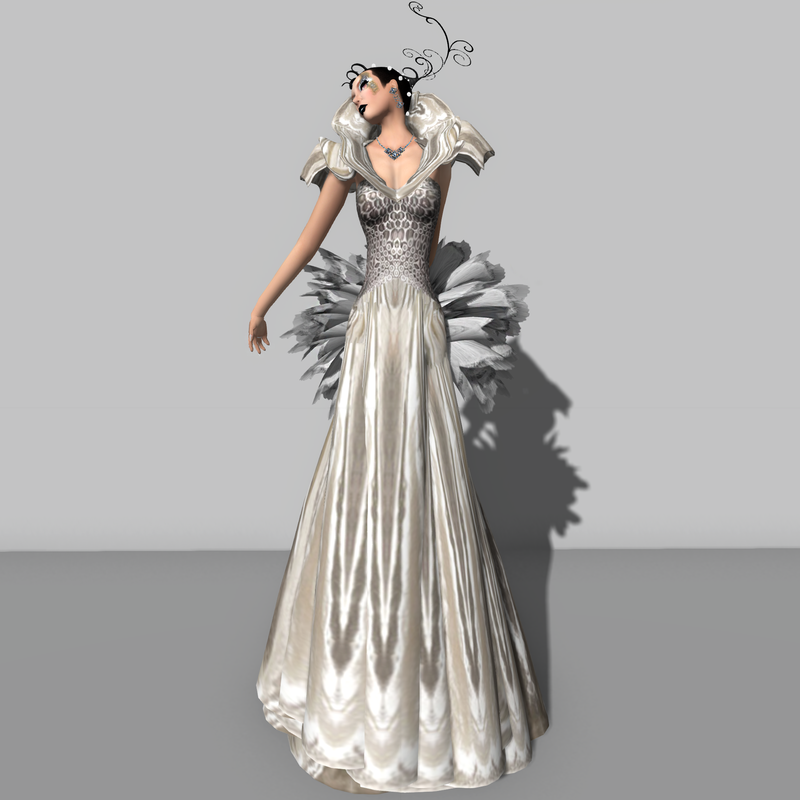 The gown also has feathers attached at the back and together with the large standing collar and shoulder cuffs, it adds a lot of character to this slender gown. As the name suggests, there was this somewhat mysterious feel to this design which inspired me to make a non-realistic look and this is what I got. For makeup, I used three different tattoo layers that were all from different creators but worked great together to make this mysterious look. I tried to avoid making it look too gothic or cyber as that will go against what I wanted to do with this outfit. This entry was posted in elegant, SL model and tagged a.e.meth, avant garde, Avant garde fashion, Boom, Boom Clothing Co, Boom Clothing Co., CCD, Dahlinks, elegant, Formal, formal, Formal style, Gown, gown, Kay, Kay Fairey, La Malvada Mujer, MADesigns, makeup, sl fashion, SL fashion, SL model, SL modeling, SL models, Vero Modero, Winter by Kay Fairey. Bookmark the permalink.